I've been diligently working on my new quilt design but just had to take a break after finding a notice in our mail box saying that there was a parcel waiting for me to be picked up at the post office. I guess the excitement on my face convinced Mr. Painted Quilt that it was something important so he, Ollie and I headed into town. I was sure it was my quilt that had made it's way home from Mary of Quilt Hollow...and guess what? It was!!! As soon as we arrived back home I disappeared into my studio and went to work on the binding. Just a short while ago, I sewed the last stitch. Glory Bound is now officially a finish! I asked Mary if she would quilt it using the Baptist fan pattern. A perfect marriage between the scrappiness and the quilting pattern, don't you think? Thanks again, Mary for doing such a great job. I absolutely love it! It's been rainy and on the cold side for the past several days, perfect weather to stay inside by the fire to design, stitch and sew. We've even had a light dusting of wet snow, but thankfully it didn't last too long. Yesterday afternoon a group of gals gathered together at A Needle Pulling Thread, the new quilt shop that recently opened in Digby, Nova Scotia, about twelve miles from where we live, for our first weekly "sew-in". Soon after arriving and settling ourselves in, we enjoyed some of Darlene's freshly baked maple syrup muffins. It wasn't long before we all got busy and settled down to work. Lots of laughs, stories, tips and techniques were shared throughout the day. Two of our blogging friends...Lesley and Colleen... were missing and we hope that one day they'll be able to join us. Unfortunately the miles separate us but maybe one day, huh gals? I worked on my December First Friday Freebie which I managed to finish last night after I got home. Now I can devote my complete time and attention to focus on a new quilt that I just finished designing only two days ago. I'm really excited about this one and I'm hoping that you're going to like it too! 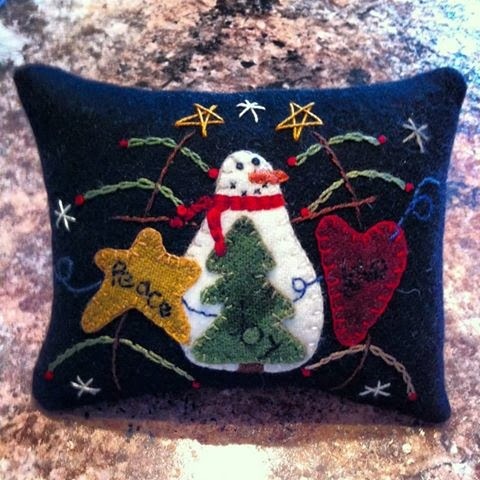 Like most of my other designs it will include patchwork, embroidery and a tiny bit of optional wool applique. The fat quarter bundle of Nature's Basket by Blackbird Designs for Moda that I was waiting for arrived yesterday, just in time for me to start on my newest project. They are going to work so well in the new design, together with some of the other fabrics that I've purchased recently. Because I work mostly with the same palette when I quilt as I did during my career as an artist, virtually all of the fabrics that I have accumulated over the past couple of years will all work well together in some future project(s) that is/are just waiting to be born! I've been meaning to show you the little wool pincushion that I stitched as a sample for one of the workshops that Darlene will be offering in the near future. Because she was so busy trying to get things ready for the grand opening of her shop, I offered to make the class sample for her. It's a Primitive Gatherings design by Lisa Bongean that I found fun, relaxing and easy to make. My favorite place to sit and stitch is in our large farmhouse-style, country kitchen. The stove is right behind the chair where I sit and when the fire is lit, you can be sure to find Frankie and Ollie stretched out on the little mat directly in front of it. Monday was a most memorable day. I finally got to meet my BFINM (Best Friend I Never Met), Lesley, The Cuddle Quilter! We agreed to meet at Tim's...or Tim Horton's for those of you who are not familiar with this famous Canadian coffee shop. We kinda knew what each other looked like from our blogs, but admittedly, my photo is about 5 years old when I was younger, healthier and thinner. Mr. Painted Quilt chauffered drove me to Digby and we headed straight for Tim's. We weren't there five minutes before Lesley walked in and we recognized each other right away. After several hugs, we sat down, sipped our coffees and chirped away without missing a beat. It was just like we had been doing this every day for our entire lives! We sent Mr. PQ on his way to walk Ollie around town while Lesley and I made our way to Darlene's new quilt shop, A Needle Pulling Thread. After chatting with Darlene for a few minutes, Lesley and I made our way around the five rooms and I had to smile at Lesley's reaction. It was almost identical to mine and everyone else who crosses the threshold into the shop for the first time. I "allowed" Lesley shop on her own while I went to chat with Darlene...but not before I indulged myself with more quilty happiness. For those of you who are on Facebook, Darlene will be offering specials on her FB site, A Needle Pulling Thread Quilt Shop, so you might want to check it out and add her page to your "likes". Lesley managed to lighten her pocketbook with lots of "must haves" as well and I'm counting the days until she and her husband decide to make the 200+ mile trip back to Digby so that we can do it all again. The only negative thing about finally getting to meet Lesley was that our visit wasn't long enough. On the positive side, I think we hugged each other enough in parting to last until our next meeting. Blogging friends are indeed the best! While I was dropping off the completed wool pincushion sample to Darlene's newly opened quilt shop yesterday, I took a few pictures to share with you...no, not of the pincushion...but of her shop. Five rooms of wonderful products, samples and finished projects for sale. Darlene was there to greet me as I walked in the front door. To the right of Darlene is the notions wall and her thread and floss collections. Many of the items had sold out already! To the left is the fabric room. The fabric selections just make my heart sing! And the pattern wall. Oops...forgot to move my cane when I took this picture. Continuing on, the next room is chock full of wool, Valdani perle cotton, redwork, backing fabric, batting and fusible web...oh, and books too! Is your heart beating just a little bit faster yet? Next is the room housing the quilts that are for sale. 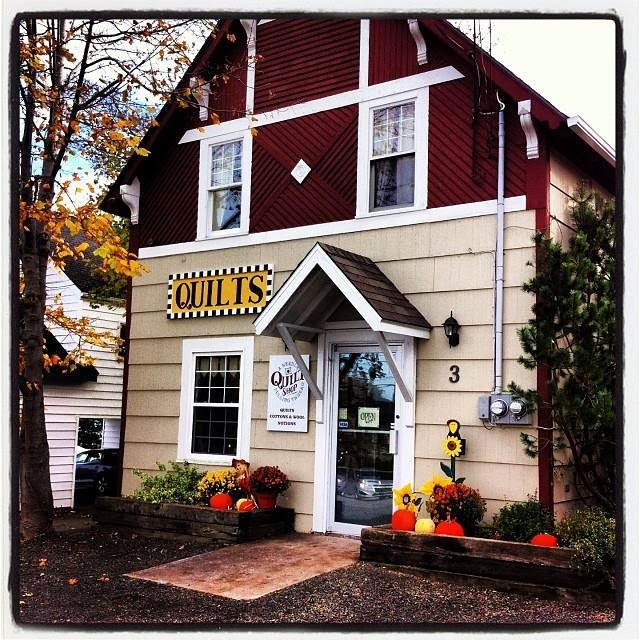 So if you ever happen to be in, around or near Digby, Nova Scotia, you must make A Needle Pulling Thread Quilt Shop one of your "must visit" destinations. I promise that you won't be disappointed. Darlene, the owner, has been quilting since she was a little girl and is chock full of knowledge about our craft. I forgot to take some photos of the classroom area which not only has more finished quilts on display but also has a design wall, perfect for when Darlene starts teaching classes in the very near future. But I'll be there again tomorrow when my BFINM (Best Friend I've Never Met)...Lesley, of The Cuddle Quilter is coming to Digby to visit Darlene's shop. Lesley lives about 200+ miles from us in Cape Breton, Nova Scotia and although we've tried to hook up before, usually my health issues somehow managed to get in the way. So after communicating for two years via our blogs, emails and wonderful telephone calls, we are finally going to have the opportunity to meet "up-close-and-personal". It's been a while since I did some serious, quilting-related shopping. Well I certainly put an end to that yesterday! After we dropped Ollie off at the doggie beauty shop, Mr. Painted Quilt played chauffeur and took me to several of my favorite shops. Would you be able to pass these by? And look what was waiting for me in our mail box when we arrived back at home. This glorious fat quarter bundle of Mid Winter Reds by Minick & Simpson for Moda arrived in my mailbox yesterday as well. I have the P-E-R-F-E-C-T project in mind for them. These patterns arrived earlier in the week. I just love Silver Thimble designs. My friend Darlene's new quilt shop opened today. She gifted me with this Moda bag which will see a lot of use in the upcoming months as I travel back and forth to her shop for some "sit-and-sew" sessions with sewing friends. Because she has been so busy working at getting her shop ready to open, I am making this little wool pincushion sample for one of her upcoming workshops. Here's Ollie today...the day after his beauty treatment. He's grubby already! I tried to stay clean...honest! And look what the groomer gave him...a red crystal earring! We just about freaked until she told us that it was affixed with a non-toxic children's glue and will probably fall off in a couple of days.